I AM FUEL, YOU ARE FRIENDS: New from Paul McCartney: "Ever Present Past"
New from Paul McCartney: "Ever Present Past"
I'm gonna warn you before you even listen to the new Paul McCartney (from his upcoming first album on the Starbucks label, as previously mentioned): It will totally and completely stick in your head. You'll think as you listen, "Huh, self. That's catchy. Kinda synthy, kinda Wings-y, a little Devo. Plus, it's PAUL, and you get That Voice, so -- not bad." Then like an hour later you'll be doing something completely different and all of a sudden you'll want to bust out with Paul's double-negative lyrics about "I got too much on my plate, don't have no time to be a decent lover..."
Audio quality fair here, I think it's a rip of a rip. The album Memory Almost Full is out June 5th, and will be the follow-up album to 2005's well-crafted Chaos and Creation In The Backyard, and then the classical album in 2006 that you didn't buy. It will be released first through Starbucks in the US, with distribution through Universal. I'm still ambivalent on the Starbucks thing, and that makes me feel like an elitist but I can't help it. I heard one of Mason Jennings' best songs in Starbucks the other day while getting my toasty beverage (apparently we still need hot drinks this time of the year here, what with the spring snow shower nonsense) and I stood there vacillating between elated (because Southern Cross is a great song) and truthfully a little . . . defiant. I heard this on the radio, the other day. I was surprised, it's actually pretty good. Not too sugary. This is so .....you are so right.. and this is so good like the orchestral break at the end of 'take it away' - this has the throwaway brilliance of late Macca and its redemptive to hear such a gorgeous return to form just before midnight here in the UK - love it! For some reason my I tunes shuffle followed it with 'Ballad of a Thin Man'.....echoes of 'too many people' fom Ram,too. Re the Starbucks thing - avoid the occasion of sin! next time you stop in at Starbucks check out the Low Stars. 4 singer songwriters, kinda like the eagles I guess, lush vocals. Made up of Chris Seefried (Joe 90) Dave Gibbs of the Gigolo Aunts, Jeff Russo of Tonic and Jude. Now I'm a big Paul fan, found room to forgive "Give My Regards To Broad Street," even, but could/can barely abide "Chaos and Creation in the Backyard" and its attendant hype. This, on the other hand, is what made me a Paul fan 35 years ago. Thanks for posting ... I might even reload my Starbucks card for this. I likewise share your ambivalence about music at Starbucks. I mean it's great that they play good tunes and I suppose if that's where someone first hears a great song or band it makes sense to offer the CDs. But all this retail cross-pollination makes my head swim. I work in a large chain bookstore (o remain nameless), which also sells CDs & DVDs, has a cafe, and sells all sorts of non-media products like lip balm. Did I mention it also sells a book occasionally...? I can't fault Starbucks for its music business. I've been stuck on road trips with rental cars, where my iPod was useless and I couldn't find decent radio. Starbucks has saved me thus far in Vegas, San Antonio and Fort Wayne. As for Macca, this is extremely catchy. We'll be hearing it all summer, and he'll be all over the place -- Today Show, GMA, CNN -- selling CDs like crazy for Starbucks. It's a cool single, and not the best song in the album. Paul still got some surprises for us saved for later. PS: Just don't understand why some think that he must quit making music...definitely, if you think like this you shouldn't bother visit a McCartney-related blog. I love Memory Almost Full, its a real return to form and gets better with every play. As far as Starbucks is concerned, it doesnt make any difference to me what label he is on, thats his buisness. "Now I'm a big Paul fan, found room to forgive "Give My Regards To Broad Street," even, but could/can barely abide "Chaos and Creation in the Backyard" and its attendant hype. 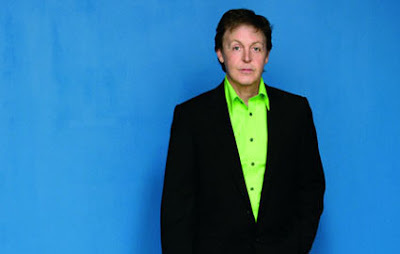 This, on the other hand, is what made me a Paul fan 35 years ago." That's it!! It's great that he is really Paul again! Btw, where did you find the other songs from the album? My experience was very similar. Bought it unheard, kinda expecting not much. Liked it on first hearing, found myself playing it again about 5 minutes later. Then, picking out the melody on pump organ about a half hour after that. Woke up with it in my head this morning and had to hear it again. It's been a long time since a Paul tune's done that to me - and I am in NO WAY a Paul-hater. Really ace melody and I think the chorus lyric is top-notch.